As most of the country freezes, we’ve been warm and dry here in the Bay Area. It’s hard to enjoy the nice weather while our friends shiver and we watch as the days without rain careen toward drought-warning records. But the silver lining – our garden is happy, and George’s cymbidium orchids are blooming like crazy. This Tracyanum is overflowing its pot with tons of flower spikes. Here’s one of my favorites, Cymbidium Final Flame. I love the large red flowers. This yellow beauty, Arcadian Sunrise ‘Patrice’, has been blooming for at least a month! And last but not least, Cymbidium Evening Star ‘Bethlemen’. Is anything blooming in your garden? It’s Bay Area autumn, warm weather in the afternoon with rich glowing light. And a bonanza of orchids blooming in the garden. Many of the cymbidiums have flower spikes, but this yellow one has them all beat. It opened about 2 weeks ago and is still going strong. This Tracyanum is also a cymbidium. I love the designerly lines. And I just noticed this gorgeous red treasure. When I described it to him over the phone, brilliant George reeled off the name: Odontioda Charlesworthii ‘Mishima’. 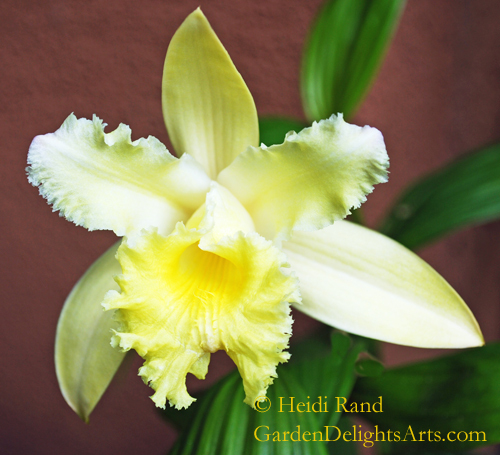 Much excitement in our garden this weekend, where the Sobralia orchids are finally blooming. 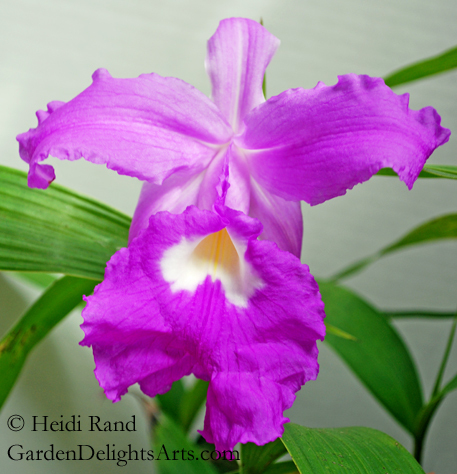 Found throughout Central and South America, Sobralia are among the tallest orchids, and their flowers range in color from white through yellow, orange, pink, purple, and red. The flowers are notoriously short-lived and ephemeral, with some of them remaining open for only a few hours before withering. This beauty opened yesterday and is already beginning to fade. The light purple flower is about 6 inches tall by 5 inches wide. The yellow Sobralia bloomed this morning. The flower is about 3 inches tall by 4 inches wide. 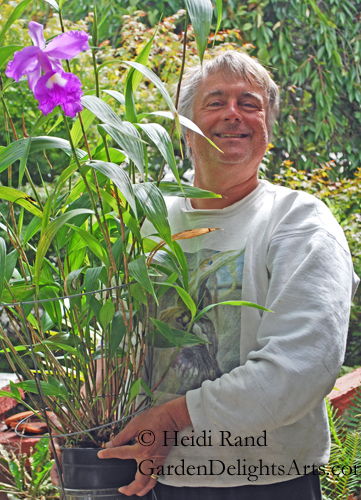 Here’s the proud grower, who wanted me to let you know that San Francisco area orchid expert Bruce Rogers hybridized both of these orchids.